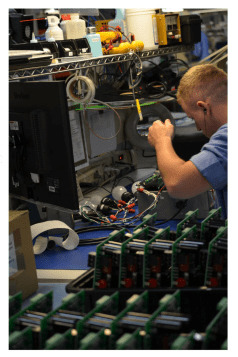 Working as a technician in the SMT Department at RBB Systems has definitely been an interesting experience, since it’s the work center where our production really begins. Two major pieces of manufacturing equipment; the Mydata MY15 and TP-9, do the machine placement (known as “pick and place”) of small surface-mounted electronic components. These machines “pick” each individual component from a reel in a magazine and “place” it onto a bare circuit board. Proper programming of the machines plays an important role in performance and quality. Trained operators populate the boards by utilizing certifications earned, including J-STD-001, IPC-A-610, IPC 7711/7721, and others. Training is provided by both the equipment manufacturers and by our experienced mechanical engineers. After the components are placed, the boards are sent to one of our reflow ovens which melt the solder paste in a highly precise way so that the components are accurately secured. We use two reflow ovens, a Viltronic XPM2 for RoHS compliant/lead-free assemblies, and an Electrovert Omniflo for non RoHS assemblies. As the boards exit the oven’s conveyer, they are thoroughly inspected by the Automated Optical Inspection (AOI) machine. Each part must be properly placed and its polarity verified in order for the boards to function appropriately. This camera-based machine detects all board defects, with the exception of non-functioning components themselves. With the use of powerful microscopes, problems are corrected immediately by qualified technicians, and the board is released for additional production steps. Everyone who works in the SMT department is certified and knows the daily procedures to make the work day efficient and productive. One of the coolest aspects of working as an SMT Technician would be operating the Pick and Place machines. I truly have learned a lot because of their capabilities. Personally, my favorite piece of equipment is the Mydata My-15 machine because of its flexibility and speed. Since these documents are the SMT department’s ''blueprint'' for component placement, learning how to read them has been not only essential but also exciting. It has enabled me to further learn the process of how a bare board becomes a finished product. Solder anomalies and defects are what we look for to verify good part connections to the board itself. 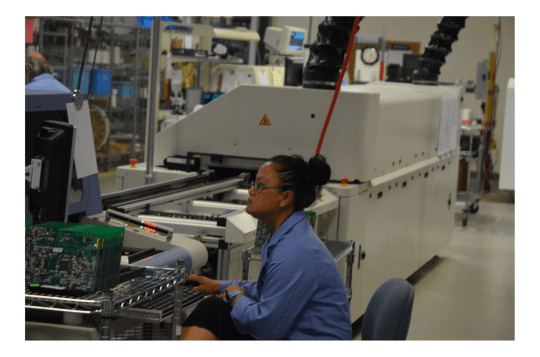 One of the most interesting parts of working as an SMT technician is trying to figure out why the machines do not place the components correctly the first time – then we troubleshoot and solve these challenges so that the components will be placed properly. What are your favorite pieces of equipment or helpful things that you’ve learned as an SMT Technician?